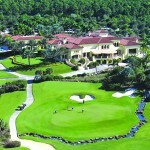 Golf is a big part of the lifestyle at Old Palm. After all, the legendary Raymond Floyd designed the course at Old Palm, maximizing what is perhaps the most visually stunning natural landscape in the Palm Beaches. The front nine is routed through sweeping savannahs and wetlands while the back nine is carved through indigenous palm and pine trees. There is even a 19th hole, a devilish Par 3 bye hole near the Club, where players can settle friendly wagers. With a course so spectacular, itâs only natural that Old Palm frequently hosts tournaments for members and guests. In April alone, Old Palm has already held a Spring Parent Child tournament and a Couples Mixed Blind Draw Tournament. And thatâs just for starters. On April 15th, there will be a Gentlemenâs Guest Day, followed by the Couples Member-Guest Invitational on the 17th, and the Ladies Closing Golf Day on the 21st. Then, there is the Club Championship, which runs from April 29th to May 1st. Between these competitions, members can usually be seen on the course playing friendly games and practicing on Old Palmâs remarkable Golf Studio. It offers a double-ended driving range, a short-game area, and three regulation practice holes â a par 3, 4, and 5 â on which golfers can replicate every shot and angle they encounter on the par-72 course. Inside the covered hitting bay, Old Palmâs instructors use advanced technologies such as Trackman Combine and the V1 Swing Analysis System to improve every aspect of the playersâ games. To give golfers that extra edge, Mark Hackett, Director of Instruction at Old Palm, is available for lessons. He is so esteemed in the golf world that he has been honored as one of Americaâs Top 100 Instructors every year since 2009.